A few reasons the uproar for eminent domain in this case is worse than for highways (if it is, in First Ward we fight highways taking our neighborhood too – not sure if you would roll over for both or not. My best (and not nicest guess) is that you think your neighborhood is too special to fall victim to eminent domain for either HSR or highways and have zero sympathy for those that do)). 2) in rural areas, having your property bisected by a highway gives you highway frontage and your land may have more use (value). The train bisects your property and the value of the remaining property only goes down. 4) the train is an enormous scam – a long con. Example – Jack Matthews’s company sold the land to Texas Central for the Dallas station. Jack Matthews’s company will be the developer of the Dallas station. Jack Matthews is one of the known “investors” of Texas Central. The investors don’t plan to make money from the farebox. Also a reason the lege and Abbott should be concerned if HSR makes money or not – it is just a scam? 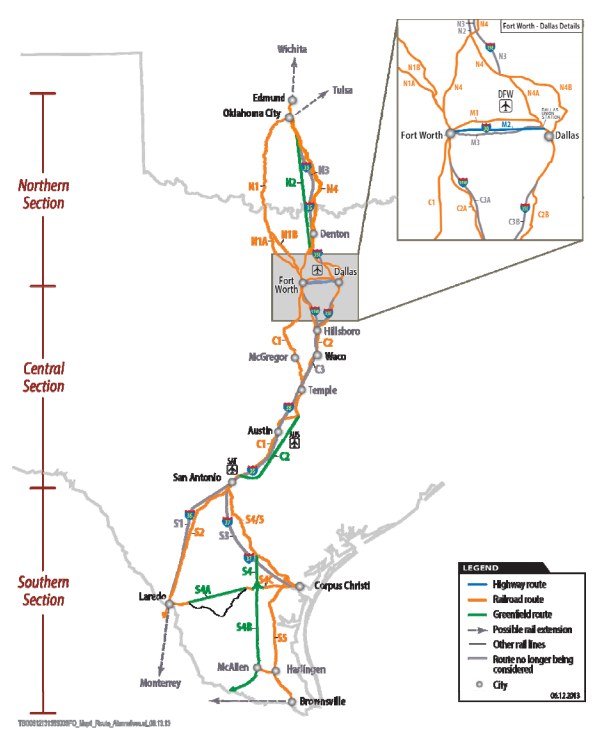 Here’s a link to an article about a toll road – I think this project has many similar aspects to the proposed Dallas-Houston HSR including TxDOT keeping usage (ridership) and other project details secret to protect company data.